December | 2008 | ifindkarma. elegance is refusal. I’m not as analytical as John Battelle ’09, so my predictions have no justification. Also, I have a caveat: whereas most peoples’ predictions come out of their brains, mine will come from another body part that shall remain nameless. Google will buy AOL, and rename the Chrome browser “Netscape”. Or AOL will announce its intention to go public, and Google will take a loss on its 5% stake. YouTube will account for a third of all Google searches in 2009, making them the number 2 search engine on the planet behind Google itself. For that alone, they were totally worth the acquisition price. Apple will buy Adobe, and make CS4 available for $149 (or “one fitty” in 50-Cent-speak). This is not so much a prediction as wishful thinking on my part. The Founders Fund, seeing billions of dollars available from The Fed at nearly zero percent interest, will start a new bank startup. Now seems like an excellent time to start a bank. eBay will be bought out by a private equity fund with too much cash on its hands and nothing to do with it. eBay will then be cut up and sold to different companies. Paypal will be fought over by Google, Facebook, and in an interesting twist, the bank startup from The Founders Fund. Sun will buy itself private with cash on hand. Or get bought by someone everyone rolls their eyes about. Yahoo will appoint one of its Board members to be its new CEO, and it will shut down and/or divest some properties. It will sell HotJobs and spin out Flickr. We wish. Microsoft will once again do nothing of any particular note, and still make billions of dollars doing it. They will continue to do nothing productive with their Facebook investment. Internally, there will be wars waged among a new faction of Microsoftees who want to develop and sell “Microsoft Linux”, to compete with the loyalists working on Windows 7. Oh, and they’ll once again change the names of their web email and their web search sites. Whoopee!! No one will be able to stop talking about Twitter thanks to celebrities and politicians using the service and being unable to shut up about it. In related news, Facebook will buy Twitter, or FriendFeed, or both. Be the Change will employ the Internets to get a million people to sign the Service Nation Declaration of Service, and rally everyone from Oprah to Ashton Kutcher to pass the Serve America Act into law. Who knows, maybe Oprah and Ashton will even use Twitter to promote service. If you’re gonna dream, dream big. It was, is, and will be the economy, stupid! 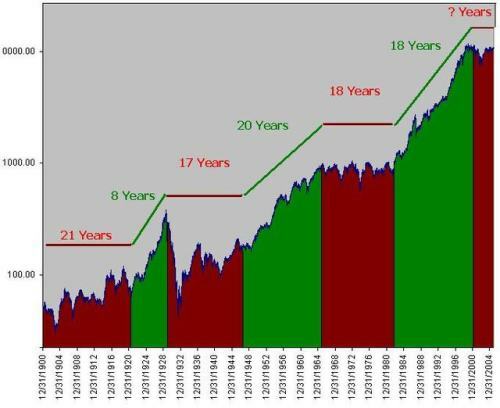 Historical Financial Charts — Are You Invested In These Markets? edythemills62093 on I spend a lot of time on PandaWhale these days. Be lucky. | ifindkarma. elegance is refusal. on Failure, loss, and learning. Anonymous on Life is like business. It’s 20 percent what happens to you, and 80 percent how you respond. ifindkarma on I spend a lot of time on PandaWhale these days. aesthetic! bears! believe! birdies! booze! buy! comics! cuteoverload! exclamations! flickr! google! halp! ifindkarma! inconceivable! invisible! kitties! life, the universe, and everything! lolcats! love! Mmmmm... mousies! nerdalert! pandas! relax! renkoo! sleep! supercute! Uncategorized words! youtube!